There were two emotions which came with the announcement of Dwyane Wade signing with the Cleveland Cavaliers this past September – excitement and confusion. Fans were undoubtedly thrilled to have another future Hall of Famer come to town, as the Cavs will need all the help they can get if they find themselves in another Finals match-up with the Golden State Warriors. At the same time, everyone – including the coaching staff – was wondering just how Wade was going to fit with the team. As the Cavs continue their current winning streak, it’s safe to say this is no longer a concern. After a rocky start for both him and the team in general, Wade has found his place with Cleveland. If you think about it, it’s pretty impressive the former Miami Heat standout has adjusted to his new surroundings this quickly. Again, he arrived with just a few weeks to spare before the season kicked off. He was almost instantly tabbed as a starter, a move which left a few members of the Cavs a little miffed. Things continued to look rocky during Wade’s first few games in Cleveland’s starting lineup. He contributed very little on the scoreboard, struggling to shoot better than 30% from the floor through his first three games. It was clear Wade’s transition to third or fourth scoring option was difficult, and coach Tyronn Lue was eventually forced to move him to the bench. One would think this might send things even further off the rails, considering Wade isn’t too far removed from being one of the best players in the NBA. It wasn’t lofty to assume he’d air some grievances after being bumped from the starting lineup. That he hasn’t made an issue of running the second unit is a big reason why he’s become such a crucial player for the Cavs. The other is what he’s actually contributing off the bench. Wade has become a huge offensive boost for Cleveland since being moved to the second unit. Where previous iterations of the Cavs included a very shaky group of backups, having Wade run the show has ensured leads aren’t blown as soon as the starters get a breather. In the 17 games played since being removed from the starting lineup, he’s only failed to score double-digit points six times. A huge example of the impact Wade is having with the team was on display in last night’s victory over Miami. Near the end of the third quarter, we witnessed the rare feat of LeBron James being ejected from the game. Additionally, Kevin Love suffered a slight finger injury soon after. Though the team had built a healthy 23-point lead, there was reason to be concerned about Cleveland’s ability to maintain it without two of its best players. After all, watching the Cavs play without James at any point over the past couple years has been quite a grueling experience. Thanks to Wade, said fears were put to bed. He contributed eight points, four rebounds and an assist in the final frame, ensuring the lead was held for good. Though Cleveland ended up only winning by eleven, much of this was due to a Miami run in the final minutes when the contest had already been decided. While coming off the bench isn’t nearly as glamorous as starting, Wade’s willingness to do so has helped him to solidify his role with the team. It’s also played a big part in the Cavs’ recent winning streak. As mentioned, Wade opened the season looking like a square peg in a round hole. During this time, the Cavs were floundering on the court as a whole. While his struggles weren’t the biggest reason for this, not getting contributions from him early on certainly didn’t help the cause. Now, the team not only has an imposing starting lineup, but Wade – alongside Kyle Korver, Jeff Green and Channing Frye – helps to make up a bench unit which has kept the team firing on all cylinders. As a result, Cleveland has significantly improved its play as of late, looking more and more like the contenders we’re used to seeing. 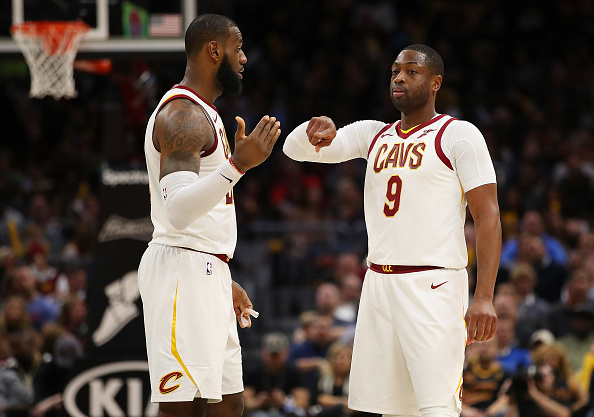 Though there are many factors when it comes to the team’s improved play, Wade’s ability to both accept and thrive in his new role is playing a big part in the Cavs getting finally their act together.